The article discusses the use of algorithmic models in finance (algo or high frequency trading). Algo trading is widespread but also somewhat controversial in modern financial markets. It is a form of automated trading technology, which critics claim can, among other things, lead to market manipulation. Drawing on three cases, this article shows that manipulation also can happen in the reverse way, meaning that human traders attempt to make algorithms ‘make mistakes’ by ‘misleading’ them. These attempts to manipulate are very simple and immediately transparent to humans. Nevertheless, financial regulators increasingly penalize such attempts to manipulate algos. The article explains this as an institutionalization of algo trading, a trading practice which is vulnerable enough to need regulatory protection. Karin Knorr Cetina is interested in financial markets, knowledge and information, as well as in globalization, theory and culture. Her current projects include a book on global foreign exchange markets and on post-social knowledge societies. She continues to do research on the information architecture of financial markets, on their “global microstructures” (the global social and cultural form these markets take) and on trader markets in contrast to producer markets. She also studies globalization from a microsociological perspective, using an ethnographic approach, and she continues to be interested in “laboratory studies,” the study of science, technology and information at the site of knowledge production – particularly in the life sciences and in particle physics. “Markets are politics,” (pg 8). I’d reverse that and say that politics are a market for power/influence, though that may be too glib. Meeting with USPTO folks. I went over their heads, but Aaron found the right level. This entry was posted in Lit Review, Paper, Phil, PolarizationGame on September 27, 2018 by pgfeldman. Today we’re launching our newest (and biggest!) course, Introduction to Machine Learning for Coders. The course, recorded at the University of San Francisco as part of the Masters of Science in Data Science curriculum, covers the most important practical foundations for modern machine learning. There are 12 lessons, each of which is around two hours long—a list of all the lessons along with a screenshot from each is at the end of this post. There are some excellent machine learning courses already, most notably the wonderful Coursera course from Andrew Ng. But that course is showing its age now, particularly since it uses Matlab for coursework. This new course uses modern tools and libraries, including python, pandas, scikit-learn, and pytorch. Unlike many educational materials in the field, our approach is “code first” rather than “math first”. It’s well suited to people who are writing code every day, but perhaps aren’t practicing their math chops quite as often (although we do cover all the necessary theory when appropriate). Perhaps most importantly, this course is very opinionated—rather than being a complete survey of every type of model, we focus on those that really matter in practice. Put Zach on JuryRoom until he is moved to A2P? This entry was posted in Phil on September 26, 2018 by pgfeldman. Part of the wrapper for this will be why these issues might matter for the iSchool’s research future. I can help with the framing there. Yikes, 4 pages in this format? That is nothing! Will really have to shave this down to the absolute minimum. To that end I think the scenarios get fleshed out in their fullest now to capture all of the ideas and then hacked brutally into 1-2 paragraphs. The abstract probably goes to 4 sentences. Images stay, but no larger. Want to redo the designed system chart so that the complexity zone is concave – done. More writing. Figured out that cars would be crashing at a rate of 3-4/sec based on 2016 data. Yikes! Worked with Aaron on response to Antonio’s proposal. IEEE Software is a “production” magazine. And a nice marker for production is what kind of libraries are available, because then articles can be written on how to use them. This entry was posted in Conferences, Paper, Phil on September 25, 2018 by pgfeldman. Working on the “Second middle part” (discussion? results?). Responding to calls to ‘be transdisciplinary4’, we have committed to applying and critically reflecting on the principles of TD in our PhD research. However, in current institutional structures and cultures of academia, this adds an additional challenge to the existing demands of PhD research5,6. Not only are we expected to navigate the terrain of interdisciplinarity described as an ‘undisciplinary journey’6 which requires ‘epistemological agility’, but we are also confronted with the task of engaging meaningfully with societal actors beyond our academic comfort zones. All of this means we are constantly trying to ‘be everything to everyone’ and risk burning ourselves out in the process. This entry was posted in Paper, Phil on September 24, 2018 by pgfeldman. In this talk I show that inverse simulation, i.e., running programs in reverse from output to input, lies at the heart of the hardest problems in both human cognition and artificial intelligence. How humans are able to reconstruct the rich 3D structure of the world from 2D images; how we predict that it is safe to cross a street just by watching others walk, and even how we play, and sometimes win at Jenga, are all solvable by running programs backwards. The idea of program inversion is old, but I will present one of the first approaches to take it literally. Our tool ReverseFlow combines deep-learning and our theory of parametric inversion to compile the source code of a program (e.g., a TensorFlow graph) into its inverse, even when it is not conventionally invertible. This framework offers a unified and practical approach to both understand and solve the aforementioned problems in vision, planning and inference for both humans and machines. Social influence bot networks are used to effect discussions in social media. While traditional social network methods have been used in assessing social media data, they are insufficient to identify and characterize social influence bots, the networks in which they reside and their behavior. However, these bots can be identified, their prevalence assessed, and their impact on groups assessed using high dimensional network analytics. This is illustrated using data from three different activist communities on Twitter—the “alt-right,” ISIS sympathizers in the Syrian revolution, and activists of the Euromaidan movement. We observe a new kind of behavior that social influence bots engage in—repetitive @mentions of each other. This behavior is used to manipulate complex network metrics, artificially inflating the influence of particular users and specific agendas. We show that this bot behavior can affect network measures by as much as 60% for accounts that are promoted by these bots. This requires a new method to differentiate “promoted accounts” from actual influencers. We present this method. We also present a method to identify social influence bot “sub-communities.” We show how an array of sub-communities across our datasets are used to promote different agendas, from more traditional foci (e.g., influence marketing) to more nefarious goals (e.g., promoting particular political ideologies). This entry was posted in Lit Review, Machine Learning, Paper, Phil, Simulation, Tensorflow on September 21, 2018 by pgfeldman. Submit pre-approval for school – done! Read through the USPTO RFI and realized it was a good fit for the Research Browser. Sent the RB white paper to those in the decision loop. Updated the JuryRoom white paper to include an appendix on self-governance and handling hate speech, etc. Today, we’re announcing the Cloud Inference API to address this need. Cloud Inference API is a simple, highly efficient and scalable system that makes it easier for businesses and developers to quickly gather insights from typed time series datasets. It’s fully integrated with Google Cloud Storage and can handle datasets as large as tens of billions of event records. If you store any time series data in Cloud Storage, you can use the Cloud Inference API to begin generating predictions. There can also be a Weight vector W: which contains the “mass” of the node. A high mass node will be more influential in the network. A constitution – a simple document that lays out how JuryRoom will be goverened. A bill of rights. What are users entitled to? The concept of petition, trial, binding decisions, and precedent. Is there a concept of testifying under oath? The addition of “evidence” attachments that can be linked to posts. This could be existing documents, commissioned expert opinion, etc. A special location for the “legal decisions”. These will become the basis for the precedent in future deliberations. Links to these prior decisions are done as attachments? Or as something else? Localization. Since what is acceptable (within the bounds of the constitution and the bill of rights) changes as a function of culture, there needs to be a way that groups can split off from the main group to construct and use their own legal history. Voting/membership may need to be a part of this. What is visible to non-members? How are legal decisions implemented in software? What are the duties of a “citizen”? This entry was posted in Paper, Phil, proposal, Rants on September 20, 2018 by pgfeldman. My current research is on the sociology of markets, focusing on automated trading. I’ve worked in the past on topics ranging from the sociology of nuclear weapons to the meaning of proof in the context of computer systems critical to safety or security. Computer algorithms are playing an ever more important role in financial markets. This paper proposes and exemplifies a sociology of algorithms that is (i) historical, in that it demonstrates path-dependence in the development of automated markets; (ii) ecological (in Abbott’s sense), in that it shows how automated high-frequency trading (HFT) is both itself an ecology and also is shaped by other linked ecologies (especially those of trading venues and of regulation); and (iii) “Zelizerian,” in that it highlights the importance of boundary work, especially of efforts to distinguish between (in effect) “good” and “bad” actors and algorithms. Empirically, the paper draws on interviews with 43 practitioners of HFT, and on a wider historical-sociology study (including interviews with a further 44 people) of the development of trading venues. The paper investigates the practices of HFT and analyses (in historical, ecological, and “Zelizerian” terms) how these differ in three different contexts (two types of share trading and foreign exchange). This entry was posted in Lit Review, Paper, Phil, ToRead on September 19, 2018 by pgfeldman. One of the main objectives facing marketers is to present consumers with information on which to base their decisions. In doing so, marketers have to select the type of information system they want to utilize in order to deliver the most appropriate information to their consumers. One of the most interesting and distinguishing dimensions of such information systems is the level of control the consumer has over the information system. The current work presents and tests a general model for understanding the advantages and disadvantages of information control on consumers’ decision quality, memory, knowledge, and confidence. The results show that controlling the information flow can help consumers better match their preferences, have better memory and knowledge about the domain they are examining, and be more confident in their judgments. However, it is also shown that controlling the information flow creates demands on processing resources and therefore under some circumstances can have detrimental effects on consumers’ ability to utilize information. The article concludes with a summary of the findings, discussion of their application for electronic commerce, and suggestions for future research avenues. This may be a good example of work that relates to socio-cultural interfaces. A satisfactory model of decision-making in an epistemic democracy must respect democratic values, while advancing citizens’ interests, by taking account of relevant knowledge about the world. Analysis of passages in Aristotle and legislative process in classical Athens points to a “middle way” between independent-guess aggregation and deliberation: an epistemic approach to decision-making that offers a satisfactory model of collective judgment that is both time-sensitive and capable of setting agendas endogenously. By aggregating expertise across multiple domains, Relevant Expertise Aggregation (REA) enables a body of minimally competent voters to make superior choices among multiple options, on matters of common interest. REA differs from a standard Condorcet jury in combining deliberation with voting based on judgments about the reputations and arguments of domain-experts. The Centre for Collective Intelligence Design will explore how human and machine intelligence can be combined to make the most of our collective knowledge and develop innovative and effective solutions to social challenges. Start putting together notes on At Home in the Universe? This entry was posted in Lit Review, Phil, proposal, ToRead on September 17, 2018 by pgfeldman. How do you make decisions on the macroscopic scale? Fast and sloppy vs. slow and accurate. What about ‘hardware acceleration? Majority rule is faster diffusion than voter model, but less accurate. Mixing models does affect the results. Is this explore/exploit as well? Swarm performance over density is a left-skewed normal distribution? Is this because they occupy physical space? Density adaptation. Is it true that people like density to a point? And that online always “feels” different from actual density? What does popularity ranking vs other ranking do to human behavior? Robot swarms are large-scale multirobot systems with decentralized control which means that each robot acts based only on local perception and on local coordination with neighboring robots. The decentralized approach to control confers number of potential benefits. In particular, inherent scalability and robustness are often highlighted as key distinguishing features of robot swarms compared with systems that rely on traditional approaches to multirobot coordination. It has, however, been shown that swarm robotics systems are not always fault tolerant. To realize the robustness potential of robot swarms, it is thus essential to give systems the capacity to actively detect and accommodate faults. In this paper, we present a generic fault-detection system for robot swarms. We show how robots with limited and imperfect sensing capabilities are able to observe and classify the behavior of one another. In order to achieve this, the underlying classifier is an immune system-inspired algorithm that learns to distinguish between normal behavior and abnormal behavior online. Through a series of experiments, we systematically assess the performance of our approach in a detailed simulation environment. 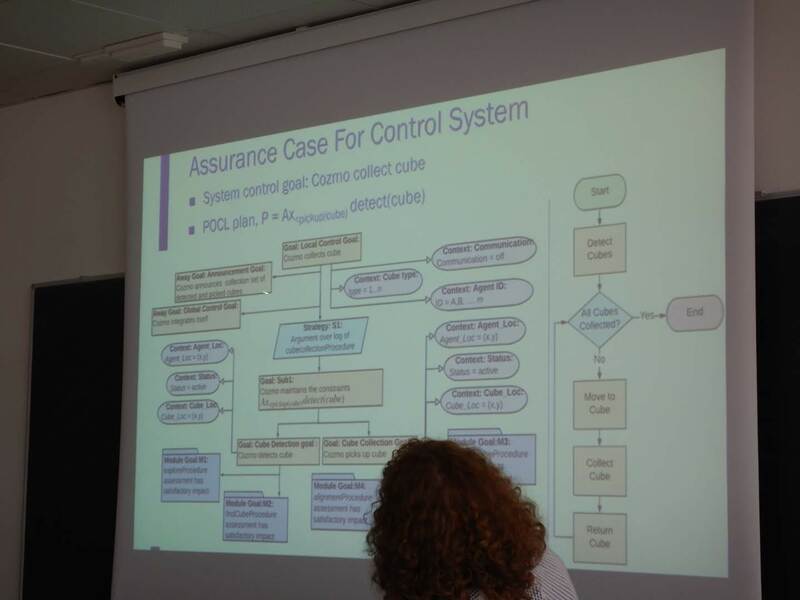 In particular, we analyze our system’s capacity to correctly detect robots with faults, false positive rates, performance in a foraging task in which each robot exhibits a composite behavior, and performance under perturbations of the task environment. Results show that our generic fault-detection system is robust, that it is able to detect faults in a timely manner, and that it achieves a low false positive rate. The developed fault-detection system has the potential to enable long-term autonomy for robust multirobot systems, thus increasing the usefulness of robots for a diverse repertoire of upcoming applications in the area of distributed intelligent automation. Question – Latent space optimization of fitness test? AutoWEKA (CASHO) – automatically defined search space <— this works! Am I approaching the optimum? Training wheels are constraints on a system that prevent catastrophic failures. 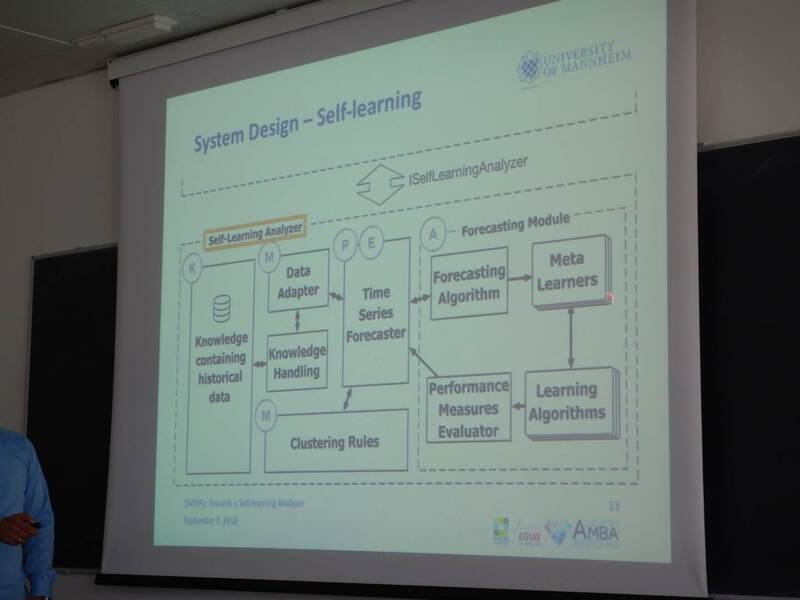 A Concept for Proactive Knowledge Construction in Self-Learning Autonomous Systems Anthony Stein, Sven Tomforde, Ada Diaconescu, Jörg Hähner and Christian Müller-Schloer <- nice paper? Combinations of weighting and gating to do optimized selection of the best estimator from a collection of estimators that work in particular situations. This entry was posted in Conferences, Phil on September 7, 2018 by pgfeldman. Drones are exploding in youth. Why? Fashion? Like AI in the ’70’s. Will it then crash? Smaller and lighter (more maneuverable) flocks are more egalitarian. Heavier, smaller groups have hierarchies because there can be trust. Might be a way of evaluating fitness tests? At least keep track of the last N (or whole history?) of chromosome so that the principal components can be analyzed. By comparing the states over time, we could find the states adjacent to problem states? This entry was posted in Conferences, Phil on September 6, 2018 by pgfeldman. Autoencoder NN – it’s like dropout? Split domain stacked cnn. The front half (encoder) NN encodes the data and transmits the “compressed” data from the hidden layer to the back half of the NN. They did use the multi-armed bandit framework as a learning system. Getting from a start image to a goal image. The image can “mean” many things. Agents provide the mapping? Noise added to guarantee convergence? This is a fitness space analysis based on optimal configuration of robots for a given task. It’s kind of a distributed traveling salesman problem combined with a market and a bidder as a way of merging the distributed solution. I wonder if it is computationally better than a GA solution. It could be a way of looking at hyperparameter tuning? Arif Merchant – (Google) Missing holistic, end-to-end solutions. First and follow-on principals. Danny Weyns – Be less ad-hoc and more scientific. Address threats to validity. Solid foundations. I talked a bit about the continuum from the low-hanging fruit of autonomic systems to the difficult task of creating self-aware systems. I think that he is talking about “personalized” entropy rather than “local” entropy. Real time detection of abnormal behaviors by using feedback from the medical staff. Play with Generated Adversarial Networks (GANs) in your browser! First, we’re not visualizing anything as complex as generating realistic images. Instead, we’re showing a GAN that learns a distribution of points in just two dimensions. There’s no real application of something this simple, but it’s much easier to show the system’s mechanics. For one thing, probability distributions in plain old 2D (x,y) space are much easier to visualize than distributions in the space of high-resolution images. This entry was posted in Conferences, Phil on September 5, 2018 by pgfeldman.